by Dave from The Longest Way Home ~ August 31st, 2017. Updated on July 26th, 2018. Published in: Travel blog » Nepal. 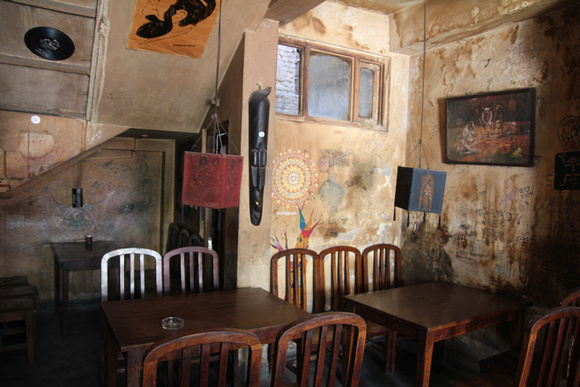 Established in 1965, during Kathmandu’s early hippie era, The Snowman Cafe still stands today near Freak Street / Jhochhen Tole. What’s more the cakes in this cafe are by far, in my opinion, the best in Nepal. Entering into the Snowman Cafe is like walking back in time. Outside this unassuming concrete store one could easily think it as just another bland local place. A few nice looking large cakes on a window display are the only hints at the wonders that lie beyond the door. Crossing the threshold into the Snowman is part of the great experience. In a city that’s slowly modernizing and in turn offering generic or “trend of the year cafes” the Snowman is unabashedly 60s. Plain dark wooden desk like tables are lined up along with shiny hard wood chairs. The yellow walls may not always have been that way but years of tobacco smoke have certainly given them that mustard color today. 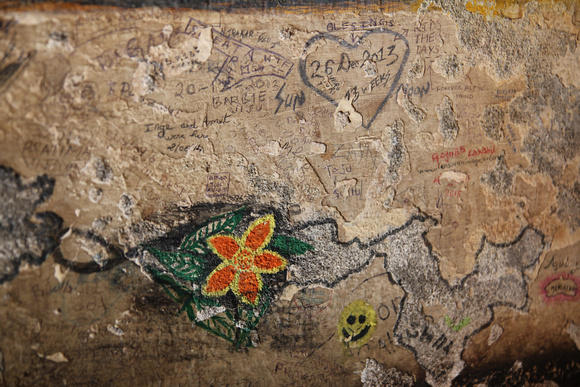 Don’t despair though, these walls are beautifully inked with the drawings, sketches and notes of people from over the past near 50 years. Aside from love notes on the walls. 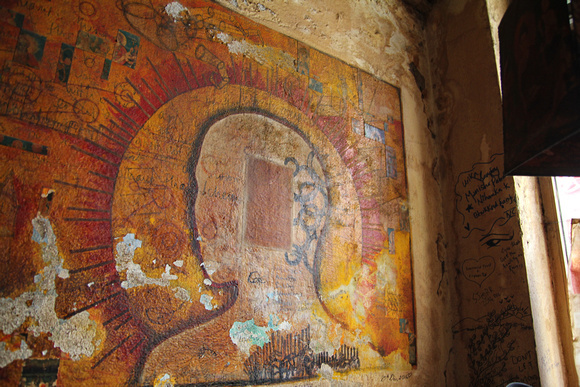 There are murals along with quotes like “I love Zion”, “Sun for all” and “United World”. It is like reading the past in the present. 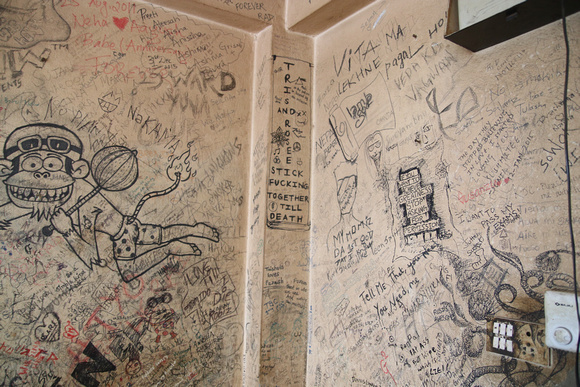 You could spend an hour at The Snowman Cafe just reading the messages on the walls … or even write your own! There’s an old wooden staircase at the back that a Bob Marley poster looks down on. At the top is another floor filled with more tables and international wall notes from decades of travelers passing through. Upstairs again is where the baking occurs, but we’ll get to that later. I’ll be the first to admit that I read about the Snowman in another guidebook many years ago. Then again more recently. It was described with similar words to the effect of “dingy” and “grungy” along with being filled full of hippies. Not exactly a raving review. The good news is that the commentary in those guidebooks is out of touch and out of date. I’ve included a more realistic view of the Snowman in my own guidebooks to Nepal here. When you serve the best cakes in Nepal. Are the last of the cities old-school cafes with a fantastic time warp look that many modern hipster like business would adore. Moreover in the afternoons your business is so packed full of people that you can only get a take way. Then you are doing something right! The only fault I will give to the Snowman is that smoking is allowed inside. But, this is Nepal and the same is true in many places. Mornings are usually devoid of young Nepali smokers though and upstairs is full of windows. In ten years of visiting the Snowman I’ve yet to see a “hipster” and have only seen some rather well dressed older hippies from the 60s/70s come in for a slice of chocolate love cake. So I don’t know where these other guidebooks get their information from. Perhaps they should actually visit it. Above all else, the Snowman offers great cakes. Moreover the nice owners are old-school charming. Something that the new trendy eateries in Thamel don’t subscribe to these days. Back downstairs to the right of the door from the inside and beside the luscious cakes is a simple wooden counter. 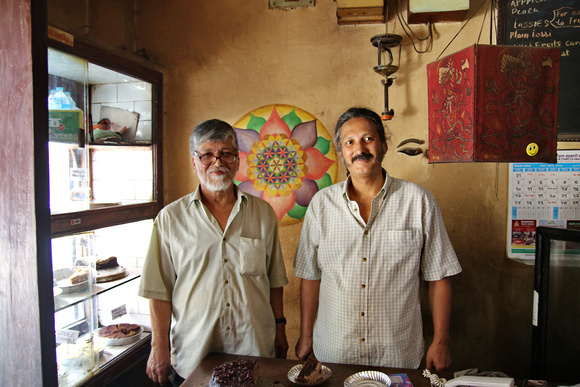 You’re likely to either meet Raju or his white bearded father and owner Ram Prasad Manandhar. Ram is a little hard of hearing these days but his genuine and lovely smile make ordering a cake from him a pleasure. Raju is normally there and is equally gracious and humble. Both men take great care when freshly cutting you a slice of freshly baked cake made by their wife/mother. It’s this old world charm that makes Snowman so great. Back in the 60s The Snowman was actually a tobacco shop first. It was by selling tobacco that Ram was able to afford to buy the building. After being a tobacco shop it then became a”western” tourist restaurant selling Mexican, Italian continental and Chinese dishes. When the cooks kept leaving for jobs overseas the Snowman converted into a juice bar. Over the years Ram has seen the hippie, backpacker and commercial trails come and go but has adapted to the changes. Hashish cake was probably one of the most popular items in Kathmandu during the 60s and people kept coming into the Snowman looking for it. But the Snowman never sold hashish cake. They only sold freshly baked regular cakes. It was a strange thing to do back in the day. Not to sell hashish. But it paid off as Marijuana became illegal in Nepal and hippies were slowly replaced by trekkers seeking tasty treats. Today the Snowman continues to adapt as it’s become a trendy place for Nepali youths to hang out in. Indeed there are more Nepali teens and 20 somethings visiting the shop than tourists by far. Most play a version of ludo on their phones or sit way in the back with a pack of cards. A few can be seen working on new wall scribbling, though that normally happens in the evening. You read more here about modern day Freak Street. I’ve tried all the cakes at the Snowman (really). Everyone seems to have their favorite though. Raju says that Nepali love their Chocolate Love Cake – a thick chocolate and jam affair. While coffee cake, chocolate cake, coconut cake, apple pie, apple and chocolate crumble along with coconut cake and chocolate brownies win the hearts of everyone. 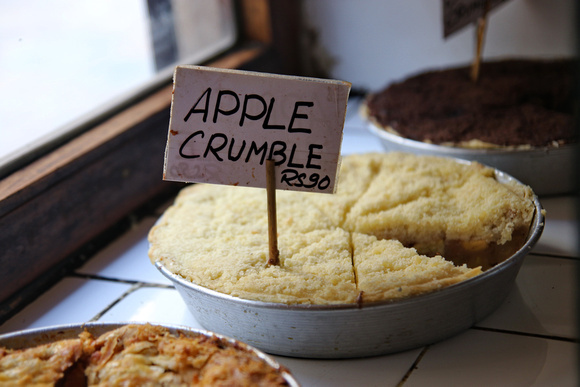 Real apple crumble at the Snowman cafe … full of real apples, crunchy bread crumbs and freshly baked in the morning – so much better than the big Thamel bakeries! For me though the best cake is the Snowman’s apple crumble. Real apples stewed into a sweet pulp are mixed with firmer apple slices. All are topped by a crunchy toasted crumb and large sugar crystals. It’s sweet, but oh so good! Although Kathmandu has a reputation for sweet cakes I usually shy away from them. I really only indulge my sweet tooth at the Snowman. The cakes are made freshly upstairs by Raju’s mother every morning at 5am. They also use a refrigerator to store them. What better than freshly baked cakes! The Snowman is listed in my guidebook to Nepal. I give it a great rating for all the reasons above. But first and foremost it’s for the great tasting and variety of fresh cakes on offer. Secondly, the look of the place is unique and something you will be hard pressed to find anywhere else in the world today. Indeed it’s places like the Snowman that should and could be tourist attractions in their own right. 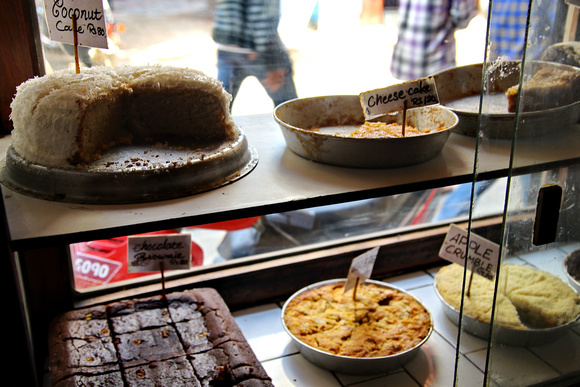 Local bakery providing cakes and pies made in Kathmandu. Open from 7am to 8pm The Snowman cafe is located on a street (Nhoosa Marg) to the left half-way down Jhochhen (Freak Street) if coming down from the south of Kathmandu Durbar Square. 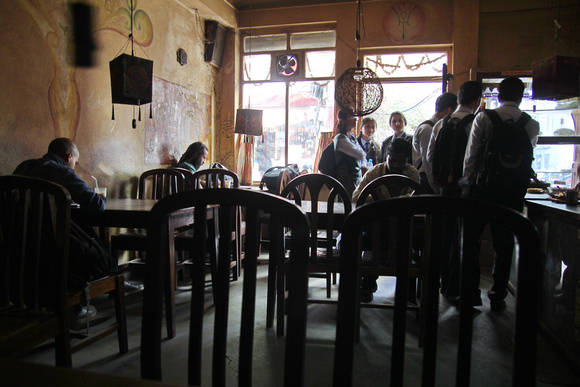 Looking for more places to eat in Kathmandu? 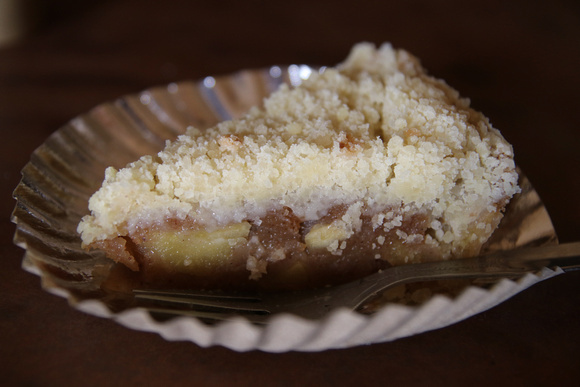 Traditional cakes and pies. Something you don’t get from the supermarket. Love the look of that apple pie. Thanks for telling people about it. Great to see places like this still surviving. Yummy. Can’t wait to try! Can you get a good coffee there too? Coffee, unfortunately, is not good there. But the cakes make up for it. Is this one of the “hidden” places in Kathmandu everyone should know about?! It is indeed one of those places. Do you think it will survive the boom Kathmandu is going through? They own the building, so yes. Any chance one could eat any of these without putting on weight! Ahhh major cravings right now! This sounds so good! Hmm ! Looks like a very tasty place !